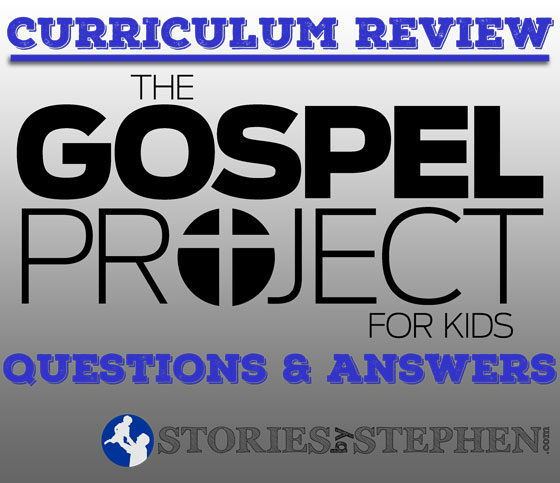 After months of reviewing what seems like a thousand children’s ministry curriculums, in order to select the right one that will serve our children’s ministry for years to come, it has been nice the last few weeks to actually use the curriculum that we selected, The Gospel Project For Kids (from Lifeway). It has been a nice change from what we did over the last year, which was basically create our own curriculum based around the Jesus Storybook Bible. While that was a rewarding experience, it was also very challenging, mostly on my time-management. I love to be creative, but it took a lot of hours each week to come up with all the material for our rotation stations and kids worship services. Now I have spent tons of time the last couple months sorting through the plethora of material provided with each weekly session of The Gospel Project For Kids. After creating everything from scratch (with a lot of help from Google and Pinterest) last year, to have just about all the material we need handed to me in a well-put-together curriculum package has been a huge blessing, while also presenting its own challenges. The Gospel Project For Kids (TGP for short) curriculum material is structured for a small group – large group – small group program. There is also an option (for a higher cost) to add a 2nd hour of worship materials. We have decided that we do not need the 2nd hour of worship materials, even though we have 2 very different hours of programming for kids each week, simply because there is already plenty of material for us in the standard package. I actually have a copy of the first month of worship material through a free trial program from Lifeway, but we are not even using the extra material because I really just have not even had time to sort through it all. With 3 age groups of material, there is more than enough to meet our needs. The hard part really is figuring out what materials to use and where to use them, and we have a fair bit of material left that goes unused. The reason we do not even need the extra hour of worship material is because we utilize the TGP material quite differently from small group – large group – small group method that is recommended by the curriculum. 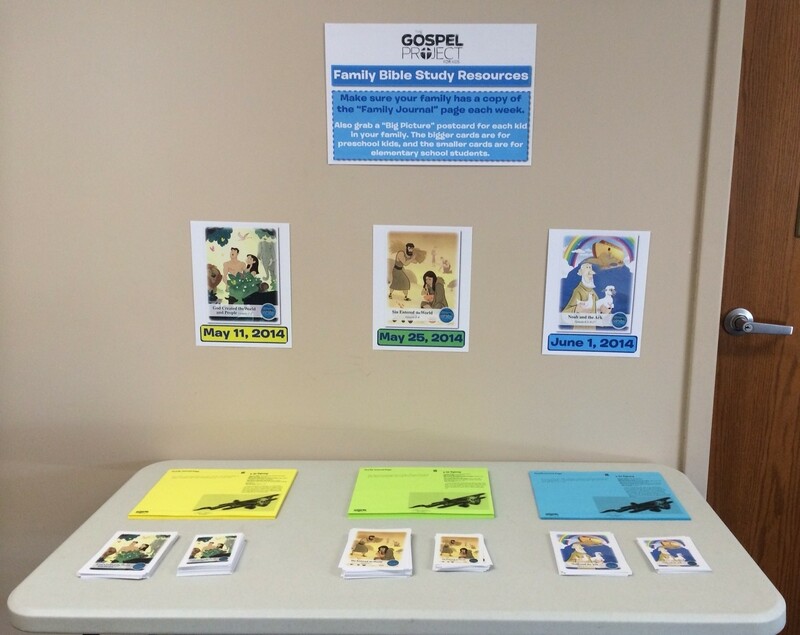 The way our rotation stations are setup, it makes it easier to select exactly which curriculum activities we will use. I will make another post soon to share which parts of the curriculum we use where. So far I am loving the family journal pages and the Big Picture Cards provided by TGP for each story, and when those items are combined with the pre-typed emails that I can send out to all the parents, I am able to give families some great resources for Family Bible Studies with very little effort or extra spending. We print and cut our own Big Picture Cards instead of buying the pricey ones from Lifeway. The Lifeway ones are much nicer, but it would add significantly to our cost to buy almost 100 sets of cards per unit. Just as we enjoy having 2 versions of the story videos, TGP also provides different versions of the Bible story text to use with preschool kids and elementary school students. I have high standards for professional graphics, and TGP does not disappoint. The logos, clipart, coloring pages, activity pages, big picture cards, etc. are all visually pleasing, and I never feel like we are giving kids cheesy or outdated printed materials. 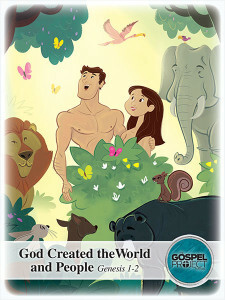 So far, I am loving The Gospel Project For Kids curriculum after the first 3 stories. I will keep sharing my experiences as we get further along into the 3-year curriculum.